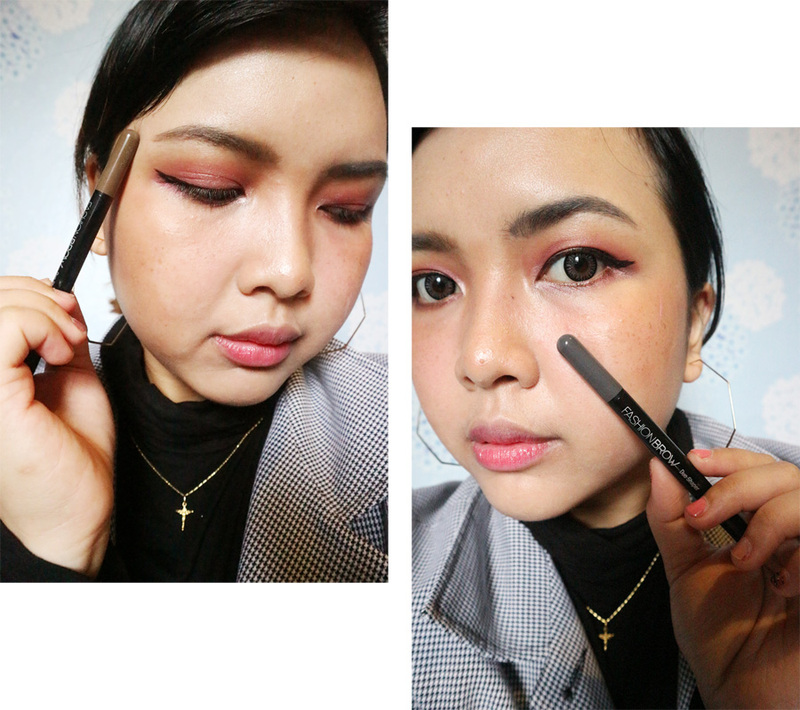 Maybelline have changed the brow game in the drugstore category with their latest brow makeup collection, so let me present you the new Fashion Brow Duo Shaper, a pencil that enhances and defines your beauty arches comes with two brow products instead. What a good deal. 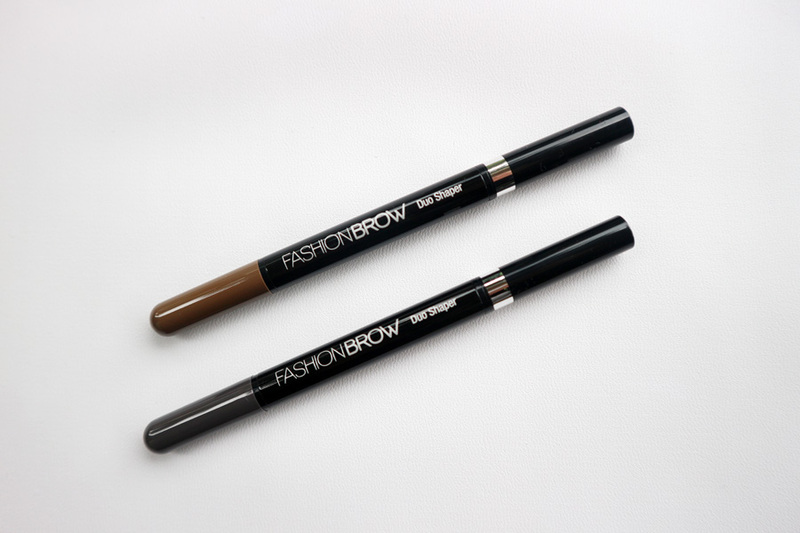 Fashion Brow Duo Shaper features a pencil with a 2mm slim tip for precise definition and silicone powder to give the illusion of thick brows. It stays on the brows up to 12 hours perfectly. No transfer & no smudge! Shade yang aku punya yaitu Brown dan Grey. The photo on the left is the brow powder on a pointy sponge applicator, kalau kalian penasaran dimana letak brow powdernya, kalian bisa liat di ujung dalam tutup aplikatornya (it's in the cap of the applicator). 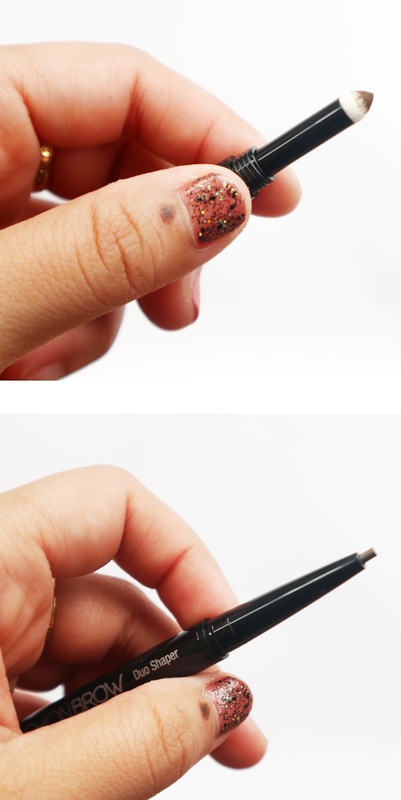 Meanwhile, the photo on the right is the eyebrow pencil. The packaging is very handy and easy to use and it takes only one swipe for decent amount of colour to show up. I was surprised to find out while swatching the products, the shades of the pencil and powder are completely different from each other. For the grey shade; the pencil side is dark grey and the powder is medium brown (coffee). 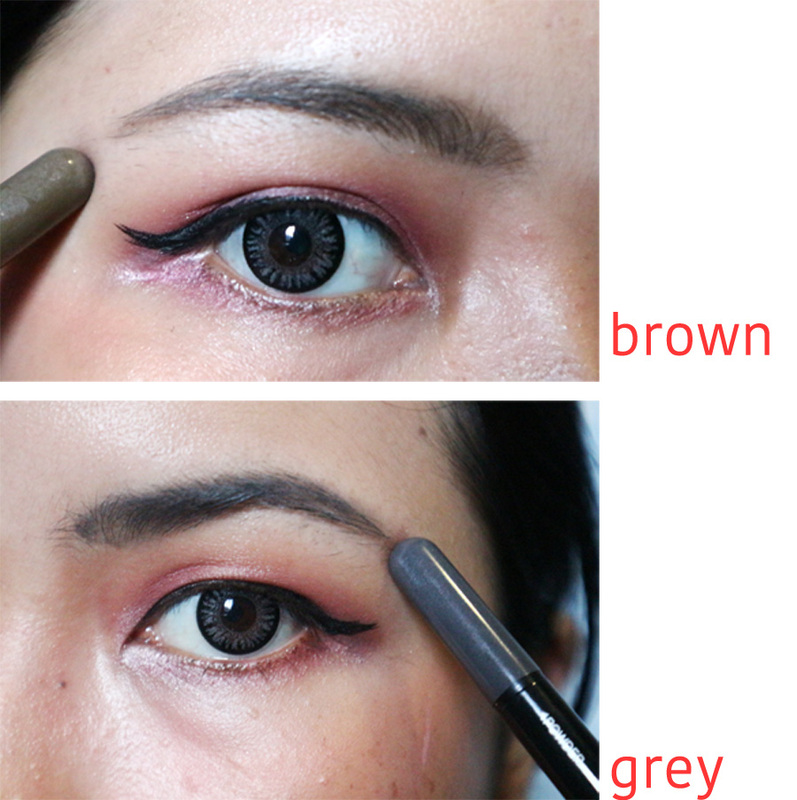 Meanwhile for the brown shade, the pencil side is dark brown and the powder is light brown. 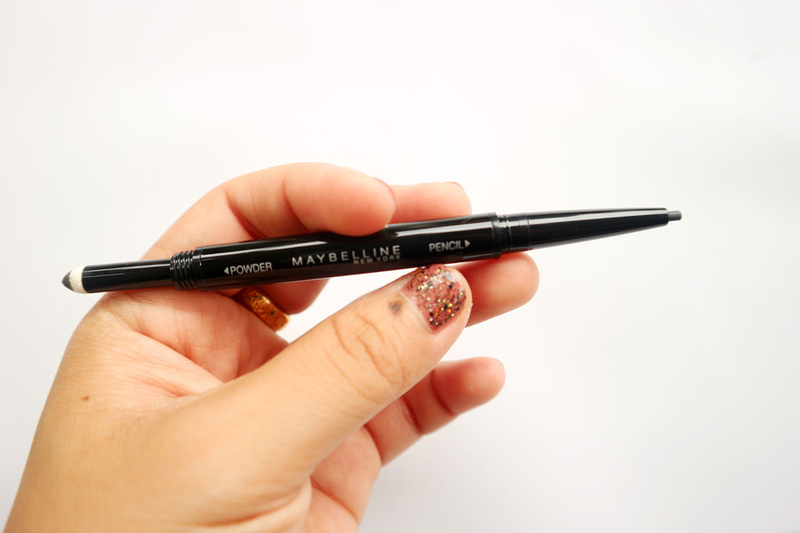 The pencil has good texture, it is not too soft and firm enough, Perfect for shaping and defining the brows. And the powder is very smooth and easy to apply, perfect to fill in sparse brows. 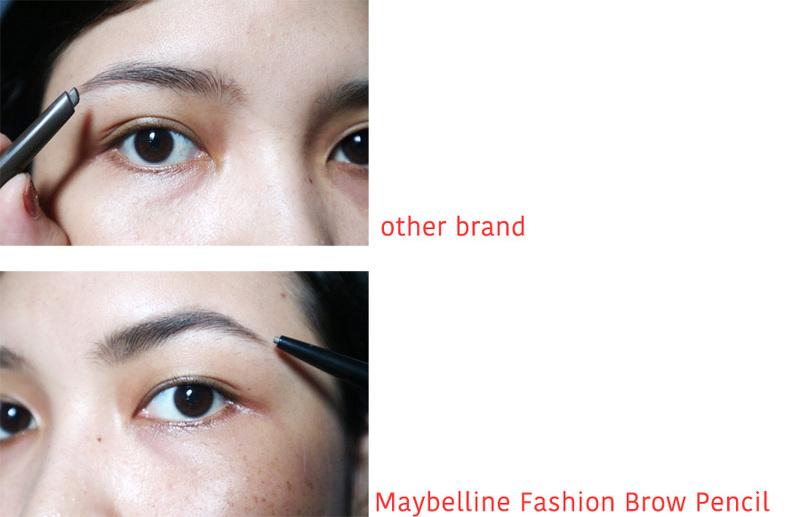 Aku juga sempat melalukan test untuk melihat hasil pemakaian dari Maybelline eyebrow pencil duo shaper vs eyebrow pencil from other brand, seperti yang kalian lihat dari foto diatas. 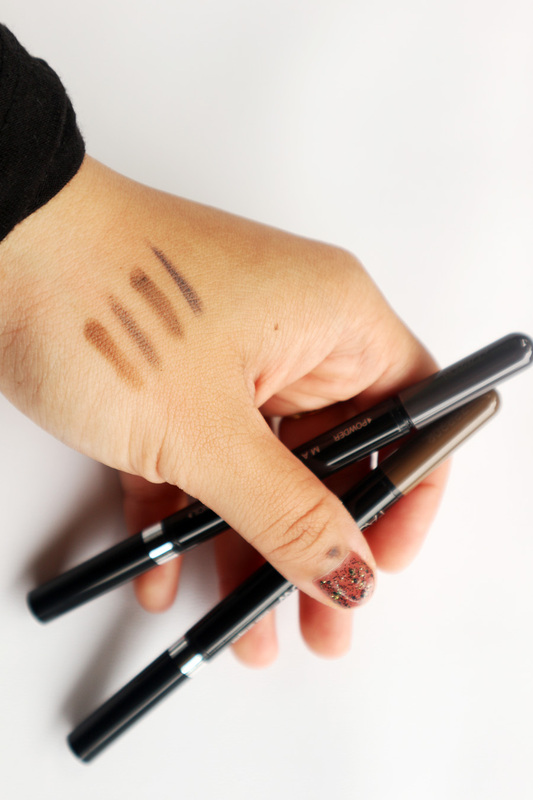 Hasil yang diberikan pensil alis dari merk lain tidak se-Bold/Strong dengan hasil yang diberikan MaybellineFashion Brow Duo Shaper. 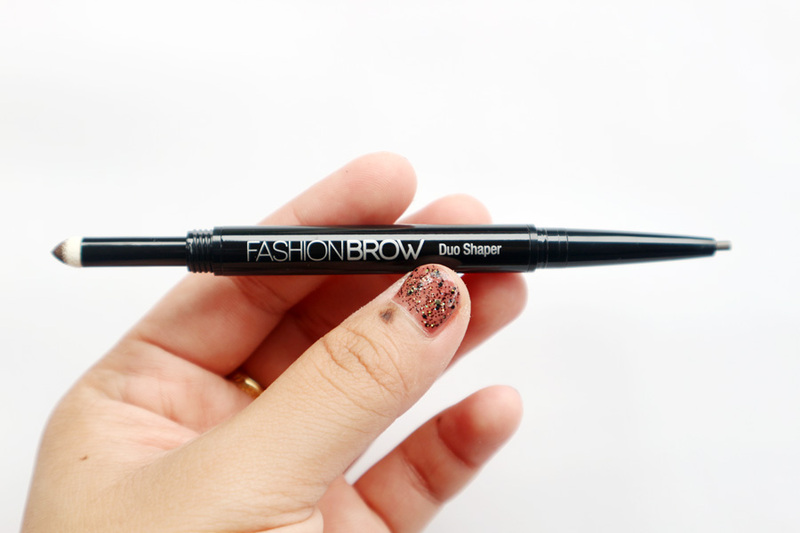 Dan juga hasil yang berikan dari Fashion Brow Duo Shaper Maybelline ini jadi semakin lebih penuh/berisi tapi tetap terlihat natural (setelah aku menggunakan brow powder dari produk fashion brow duo shaper ini). Yup, I like to fill in my brows using light strokes by using the pencil to fill in the gaps first then I give a definition to my brows with the powder. It perfectly blends all over the brows and makes them look fully defined. This is a must-have one even because of its price. 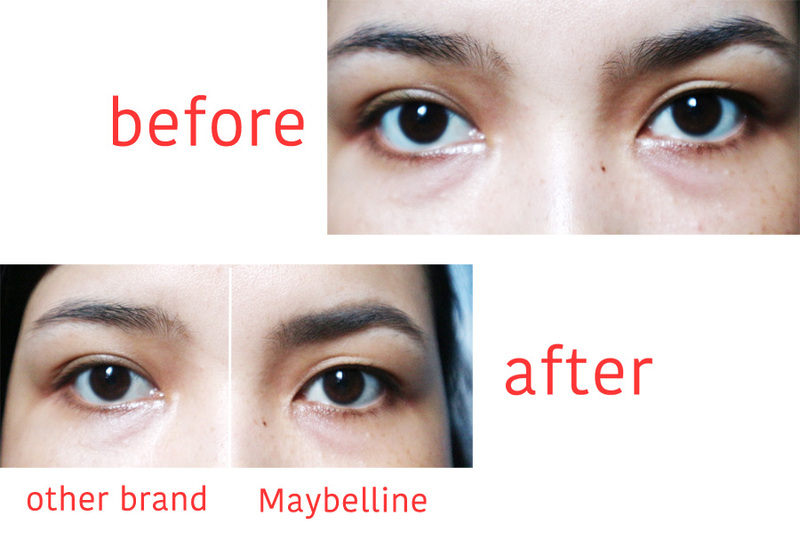 Alis kiri menggunakan produk brand lain sedangkan alis kanan menggunakan Maybelline Fashion Brow Duo Shaper. 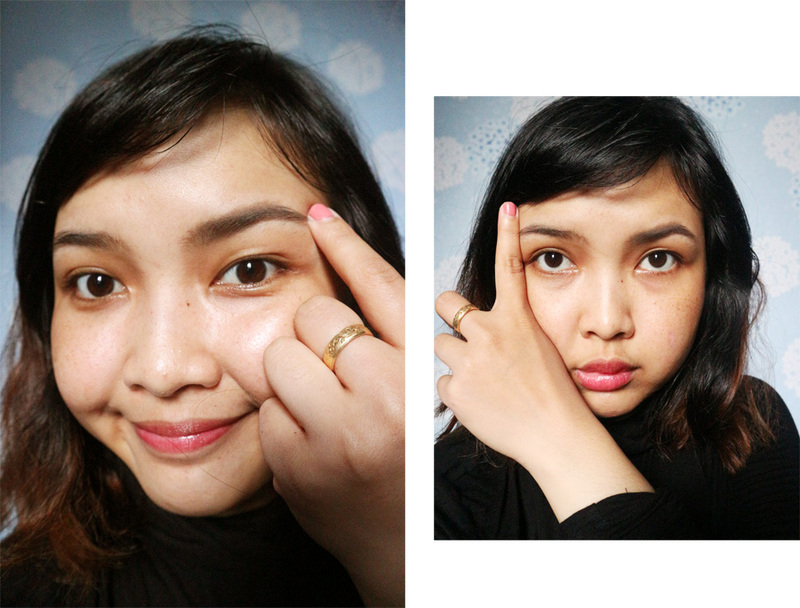 Oia eyebrow product ini sama seperti produk Maybelline lainnya loh, Long Wearing & Water/Sweat-proof. Jadi gak perlu yang namanya touch up dan juga kalau kita membasuh muka sekalipun, eyebrow ini masih tetap bertahan loh. 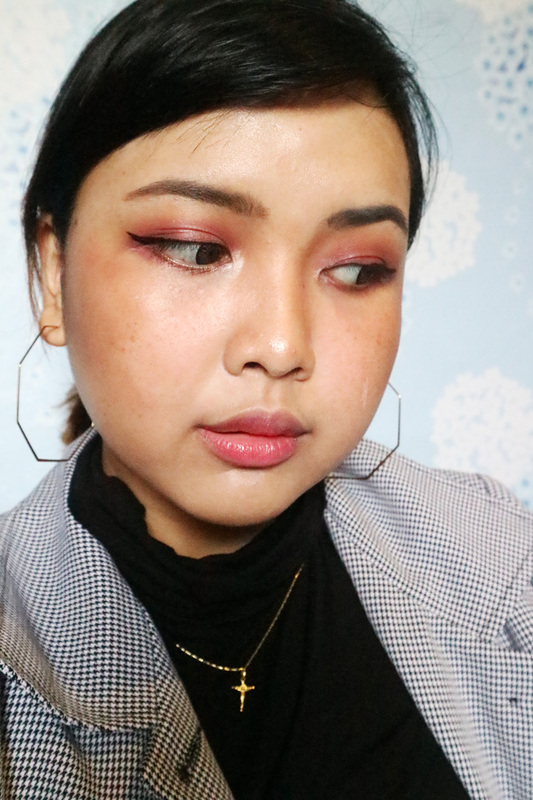 I also created my kind of office-look makeup using two different shades of Maybelline Fashion Brow Duo Shaper. You need 2-3 swipes for the perfect color with this pencil. 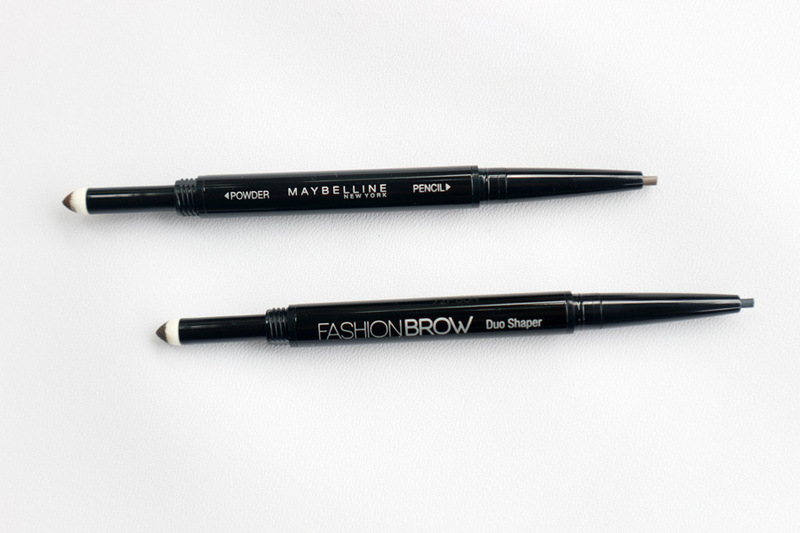 I like to apply the pencil one first and define my brows shape with it. Then, I fill up the gaps. After that, I apply the powder applicator to smudge all the edges and make it look more natural. The Grey shade grey matches my eyebrows perfectly and it gives a natural eyebrow-look. Meanwhile the Brown shade gives me a softer eyebrow-look. And I can say both shade works great on me and it will work for Asian skin tones too. Both shades have medium to heavy pigmentation and yield a soft matte payoff. In my opinion, different brow shades can be used on rotation and it depends on your mood or the look you want to be seen (softer brows or bold brows) for on a certain day. 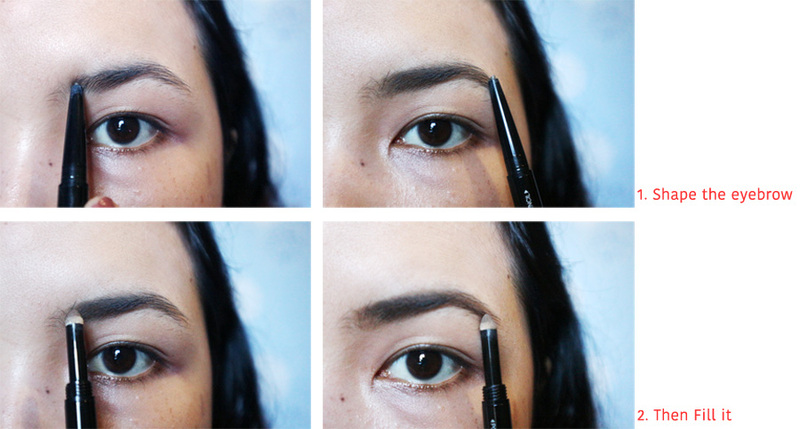 Pokoknya, alis jadi terlihat natural gitu sih kalo pake Maybelline Fashion Brow Duo Shaper ini, gak akan susah gambar alis deh kalo sudah pake ini. I highly recommend this product, it is must for every woman who likes fuller looking and more defined brows with a natural finish, grab one soon! It's just right for its price too. You can buy it at nearest Maybelline makeup-store (at your nearest mall) or buy it online through Lazada. Norton protection & Install item on PC or Mac by entering your product key in Norton setup window. We provide independent support service for norto.com/setup from the event to set up, manage, download, install or reinstall Norton antivirus.